Want more traffic? In a business where more reach and engagement means more advertising revenues, every publisher wants more traffic. So, what if you could double your traffic with no additional investment in content? For a while, I’ve been writing about how digital media requires as much emphasis on distribution and audience development as on content; and how social networks offer the greatest opportunity to build audience. But we just hit a new milestone that finally crosses into new territory: proving that mastering social distribution can double your traffic. And a model with twice as much engagement can be twice as valuable. When you consider that the leading web publishers are getting less than 6% of their traffic from social on average, that’s some serious untapped audience potential. Results took a little while longer to compile for July: social traffic to the Top 50 publishers on the web remains remarkably flat, with the average publisher adding only 0.2 percentage points to their social traffic composition. What’s up with the slump? Sure, we could all be a running a little faster, but there are signs that Facebook’s internal priorities are putting a damper on publisher progress. Search and advertising initiatives have been getting a lot of attention in light of the post-IPO hangover, and platform initiatives seem to be taking a back seat. For the Win: Wetpaint, People, NFL! Despite a lackluster performance overall, we did have a few sprinters on the Social Leaderboard. CBS jumped 6 spots and added 3 percentage points to its social traffic composition to become the 4th most social publisher on the list. People held a steady pace and was able to reclaim the #2 spot on the Social Leaderboard when NFL and MTV both stumbled and fell into 3rd and 5th place, respectively. Wetpaint Entertainment held the top spot with a 5.7 percentage point gain that put us at 35% social. We’ve been measuring social performance on two metrics: 1) Social Composition (percent of traffic coming from social) and 2) Social Volume(total number of visits from social). 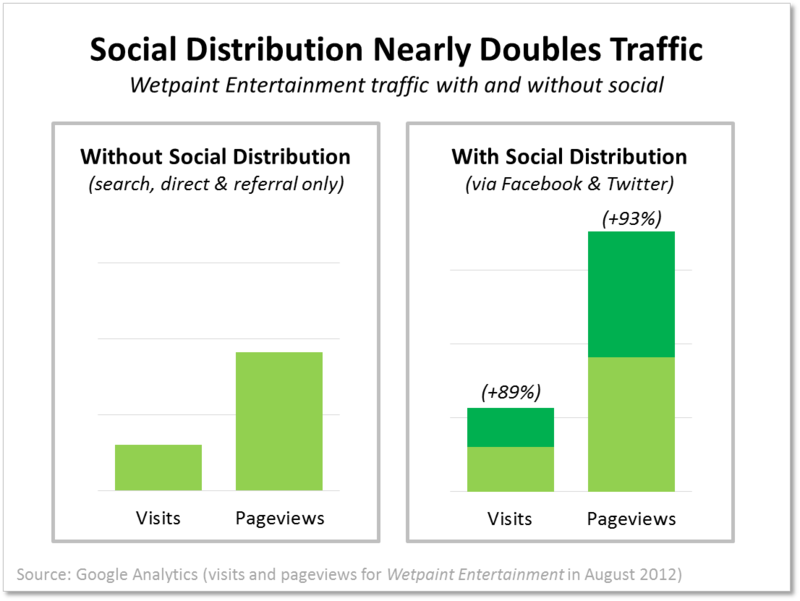 On the second metric, the average publisher was up just slightly this month (by 110K social visits). The Huffington Post is still the publisher to beat on this list, and the publishers who topped the list this time are the same publishers we saw in last month’s Top Ten.